Bathrooms And Showers Direct - Blogs - Find the right Salamander pump. Finding the right pump can be very confusing but we’ve written this guide to help. What is Positive or Negative Head? To figure out if you need a positive or negative head this would depend on the location of your cold water storage tank, pipework and outlets. The diagram show the difference between a positive and negative head. You will notice the negative head side shows the pipework 600mm under the cold water tank and the outlet above the cold water tank. Negative heads can be used on a positive head environment hence they are sometimes know as Universal head and are a popular choice due to this. What pressure rating would I need? Pumps are rated in bars, the suggested rating depends on the amount of outlet and the type of application. The image above show the suggested bar ratings depending on application. I don't know what hot water system I have! Above are the three types of hot water systems. Can I fit a pump to my Combi boiler or Unvented system? The simple answer is 99% of the pumps must be fitted within a water system which has stored hot and cold water which is known as vented/low pressure system. You will normally find a hot water tank in a cupboard and a cold water tank in the loft. Both a Combi boiler and Unvented system, heats the water directly from a mains feed which means you will not have a cold water tank. 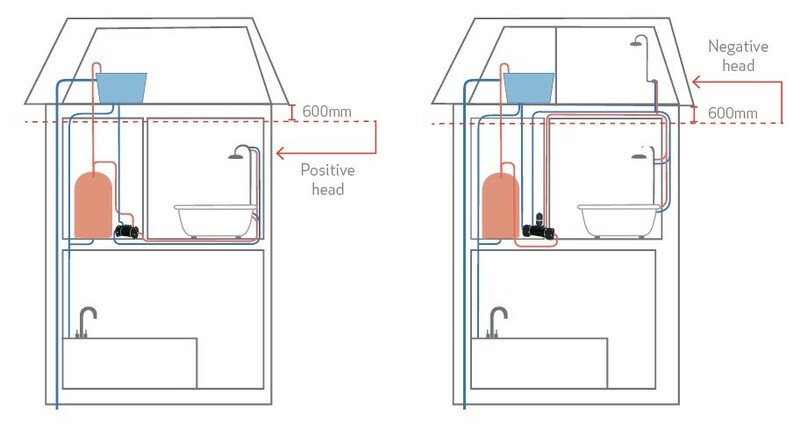 If you have a Combi boiler or Unvented system and find your cold water is slow into your property this could be affecting the performance of your system and you may find a dedicated mains pressure pump will help as this increases the water pressure to the system which in turn helps the system perform to its optimum performance. If you are every unsure we would always suggest contacting a reputable plumber or call the Pumpwise team at Salamander on 0191 516 2002. If you require both hot and cold to be pumped simultaneously you will require a twin pump. If you only require the hot or cold to be pump you will require a single outlet pump. Salamander have a handy walk through pump selector to help you find the perfect pump. Next: Salamander Pump's Amazing feature explained.